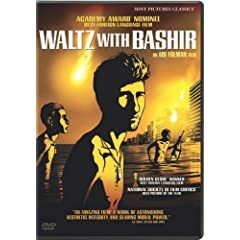 Waltz with Bashir, the animated documentary about israel's 1982 war with Lebanon, is easily my most anticipated release this week. Friends' and critics' raves about the film have pushed it to the top of my shopping list. Two other documentaries that deserve a special mention are FEMA City and Louise Bourgeois: The Spider, the Mistress and the Tangerine, which profiles the noted feminist and artist. With the Neil Young Archives, Vol. 1: 1963-1972 a constant soundtrack to my month already, I am looking forward to the concert film, Neil Young: Rock At The Beach - Live 1989. John Lennon & The Plastic Ono Band: Live in Toronto '69 is another live concert film out this week that piques my interest. The big name theatrical releases this week include Inkheart and Confessions of a Shopaholic, but I am most looking forward to the DVD debut of one of my favorite films, My Dinner with Andre, and the Criterion Collection release of Last Year at Marienbad.